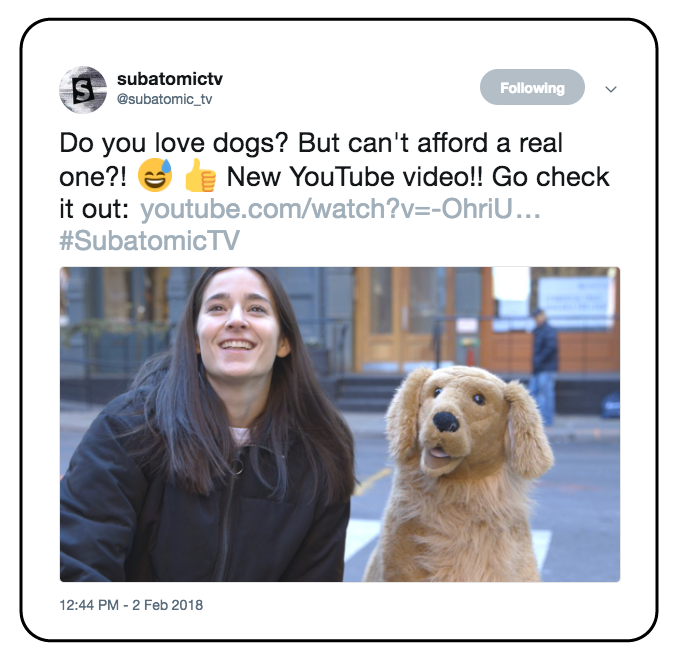 This is a digital comedy sketch that lives on Subatomic TV’s Youtube page. Subatomic TV was Kworq’s original content studio that I was heading during my time as Video Producer and Director of Content at Kworq. At the time we felt everything in the world was so serious, so we wanted to create something bizarre that would get people laughing. In addition I had just bought a stuffed dog at the time, which was absolutely ridiculous - so we decided to incorporate him into a sketch. We also used Twitter, Instagram, Facebook, and Reddit to promote this sketch to a broader audience.